The installation package can be downloaded at Novell. The following instructions show how to install on an Oracle Virtual Box as recommended by Unify and supported as a virtualized VMWare vSphere system using either Version 4 or 5. 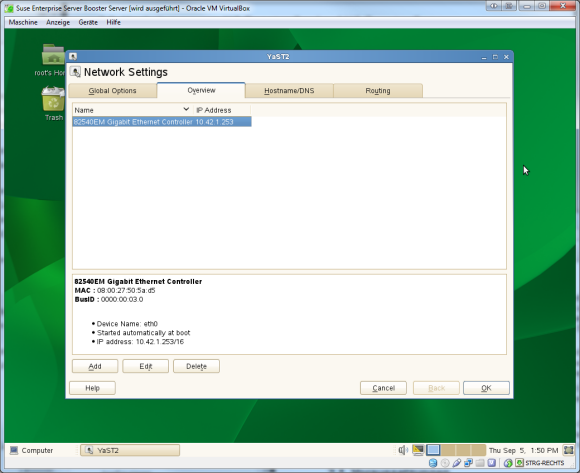 Assign a static IP address to the system using YAST Network Settings. Do not forget to set a DNS server and the default gateway so that the software can be updated later. 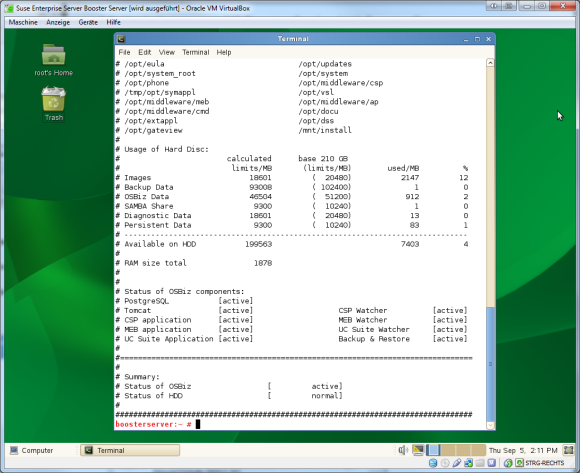 Insert the DVD (ISO image) with the OpenScape UC Booster Server. 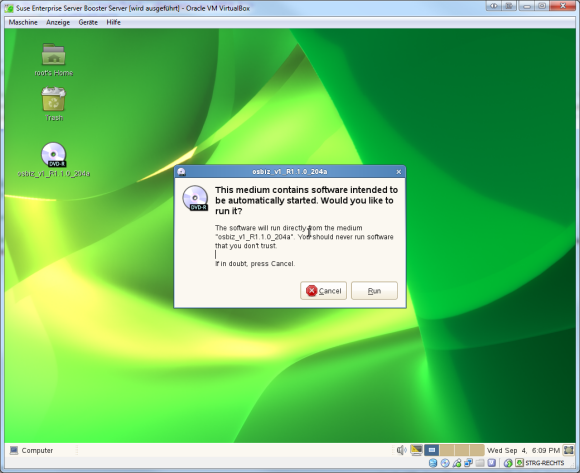 You can confirm the installation using the dialog shown by pressing the Run button. If the dialog does not appear, select the DVD-ROM icon and click on the Open with Autorun... item from the context menu. Confirm the installation of the RPM package by clicking Confirm. Enter the IP address for the OpenScape Business installation and click Continue. If you already use a DHCP server in your network, choose No so that this service will not be started (the default setting) by clicking No. Set the PC to re-start by clicking the checkbox and then click Continue. The software will then be installed and the initial configuration will start after the PC has been re-started. Once the PC has been re-started, log into the Booster Server using the web interface. The web interface will only be available using the HTTPS protocol. Make sure to change the password for administrative users. The configuration of OpenScape Business will be presented in Integrating UC Booster Platform with the OpenScape Business System. You can check the configuration and the status of the individual services using oso_status.sh while the software is running (once Booster Server has been integrated with the telephone system).